In EyeSpyFX we develop apps for complex security cam and access control systems for international clients. We have often been asked what App Prototyping Tools we use. Well – the truth is we don’t use any specialized “app prototype tools”. That doesn’t mean that we don’t iterate and prototype – we certainly do, it just means we don’t use those app prototype tools. Nor does it mean that we are against the use of App Prototype Tools – we are keeping an open mind, but our current process does not involve those sort of tools. We start out with a briefing document and then we draw stuff out – by hand (no prototype tools). The drawings are loose and very often we do a lot of them – often 100 to 200 sketches. At some point we scan the drawings and start to create higher fidelity images, often systems diagrams and then screen shots. 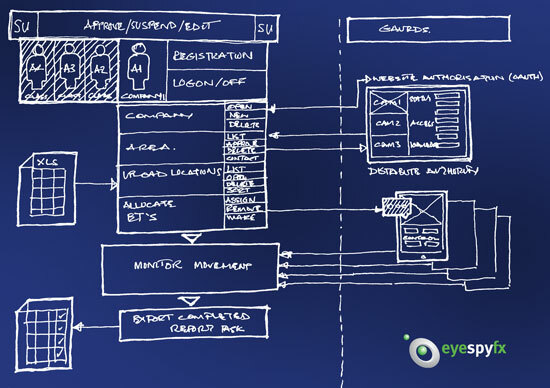 The system diagrams are agreed with clients and based on these diagrams we build the technical backbone for the project. The screen shots become storyboards and interaction walk-throughs for different personas who will use the app. These walk-throughs are checked against the system diagrams and gradually the screenshots mature and become graphic assets for the app development project. To do all this we use, Illustrator, In Design, Powerpoint, Photoshop, etc. Each of these are powerful software packages but general in nature and not specific App Prototype Tools. We feel that this fluid process might become a bit constrained and over formalized if we used an App Prototype Tool – so we don’t and so far so good.